The architect Renzo Piano explains his own working procedure thus: ‘‘You start by sketching, then you do a drawing, then you make a model, and then you go to reality—you go to the site—and then you go back to drawing. You build up a kind of circularity between drawing and making and then back again.’’About repetition and practice Piano observes, ‘‘This is very typical of the craftsman’s approach. You think and you do at the same time. You draw and you make. Drawing . . . is revisited. You do it, you redo it, and you redo it again.’’ This attaching, circular metamorphosis can be aborted by CAD. Once points are plotted on-screen, the algorithms do the drawing; misuse occurs if the process is a closed system, a static means-end—the ‘‘circularity’’ of which Piano speaks disappears. Because of the machine’s capacities for instant erasure and refiguring, the architect Elliot Felix observes, ‘‘each action is less consequent than it would be [on] paper . . . each will be less carefully considered.’’ Returning to physical drawing can overcome this danger; harder to counter is an issue about the materials of which the building is made. Flat computer screens cannot render well the textures of different materials or assist in choosing their colors, though the CAD programs can calculate to a marvel the precise amount of brick or steel a building might require. Drawing in bricks by hand, tedious though the process is, prompts the designer to think about their materiality, to engage with their solidity as against the blank, unmarked space on paper of a window. Computer-assisted design also impedes the designer in thinking about scale, as opposed to sheer size. Scale involves judgments of proportion; the sense of proportion onscreen appears to the designer as the relation of clusters of pixels. The object on-screen can indeed be manipulated so that it is presented, for instance, from the vantage point of someone on the ground, but in this regard CAD is frequently misused: what appears on-screen is impossibly coherent, framed in a unified way that physical sight never is. Troubles with materiality have a long pedigree in architecture. Few large-scale building projects before the industrial era had detailed working drawings of the precise sort CAD can produce today; Pope Sixtus V remade the Piazza del Popolo in Rome at the end of the sixteenth century by describing in conversation the buildings and public space he envisioned, a verbal instruction that left much room for the mason, glazier, and engineer to work freely and adaptively on the ground. Blueprints—inked designs in which erasure is possible but messy—acquired legal force by the late nineteenth century, making these images on paper equivalent to a lawyer’s contract. The blueprint signaled, moreover, one decisive disconnection between head and hand in design: the idea of a thing made complete in conception before it is constructed. ‘Plan’, by the virtue of its futuristic connotation, is embedded in the notion of time. An architect’s plans, however, more often than not created with a static view of time. 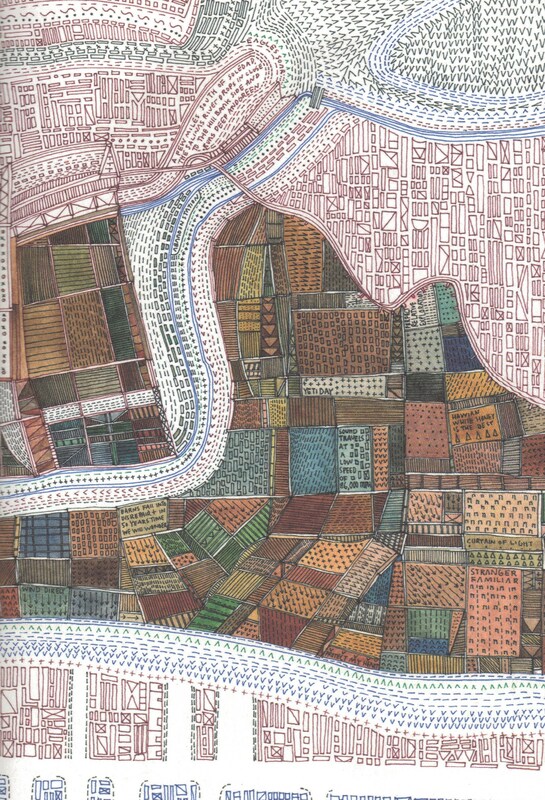 Mapping is an exercise in capturing a particular moment within history. How do we then represent time in an architectural drawing and instead of making ‘plan ahead of time’, make ‘plan in time’? Drawing by hand itself creates something that can be traced, line by line back to it source. Can all the drawings be ultimately connected together to form a story? Horizontal drawings invite people to read the drawing in time – you cannot understand it if it forces you read bit by bit, not in its totality at once. Then talking about time, is it always linear? Are there ways where events (Tsumi) for example complicate time understood through architecture? 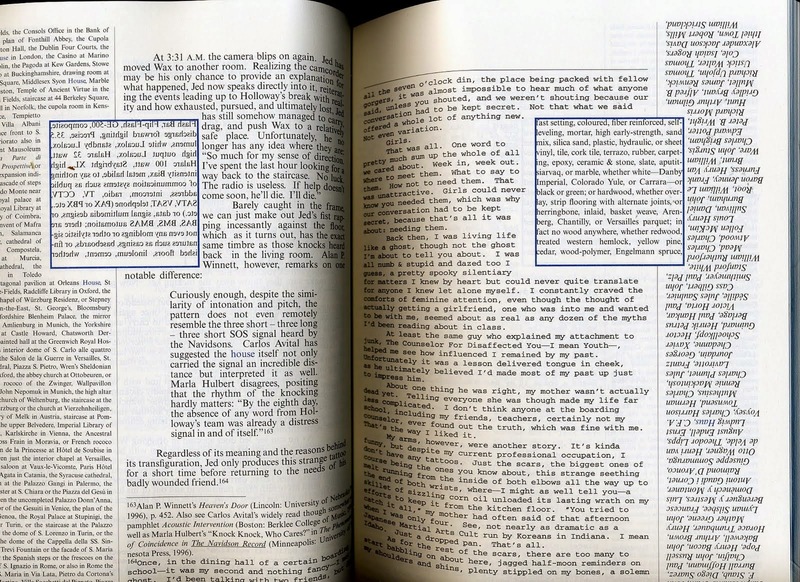 In the case of books, Mark Z. Danielewski’s House of Leaves is a perfect example of an unlinear flow of narrative(s) that also occupy different spaces in the physical book itself.